The podcast shows, The Class Reunion are now available as a podcast without the music. You'll will be able to hear what we talked about during the show. We hope you enjoy hearing these podcasts and if there is something you'd like to add to the podcast, please write and let us know on the contact page. Notice: When you press play, you will experience a delay while audio file downloads. March 1983: Jim Thomas interviews Ricky Nelson. 2008: Jim Thomas interviews Elvin Bishop. Armando Camina is a professional media personality in radio, television, and currently the Founder of the nonprofit Hope, Faith, and Dreams based in San Antonio, Texas. The Wonderous Story of Page Turner, by Armando Camina, voiced by Ric Furley, produced by J.J. Thomas. Armando Camina is a professional media personality in radio, television, and currently the Founder of the nonprofit Hope, Faith, and Dreams based in San Antonio, Texas. All the podcasts are recorded in MP3 format and are streamed to you for your listening enjoyment. Simply use the players above to listen and navigate through all of the podcasts or choose the bottom player and listen to them all one after another. 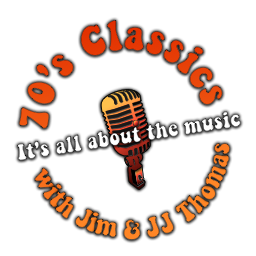 We hope you enjoy these podcasts from our past radio show, 70’s Classics - The Class Reunion. We will add new ones as time goes by, check back for updates.